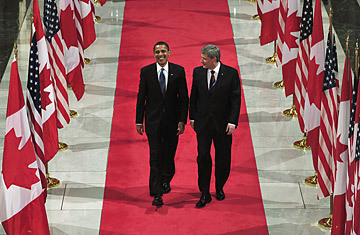 The first meeting between President Barack Obama and Canadian Prime Minister Stephen Harper, which happened Thursday in Ottawa, covered a wide range of common interests, such as a revival of the North American economy, reductions in greenhouse-gas emissions, and the war in Afghanistan. But the unscripted moments of the President's first foreign visit since being elected to the White House  including a declaration of love for Canada and an impromptu visit to an Ottawa farmers' market for a beaver-tail pastry  overshadowed the official agenda. During the course of the 45-minute news conference, Obama and Harper jointly announced a clean-energy dialogue between Canada and the U.S., in part intended to develop alternative energy sources and reduce carbon emissions from Canada's tar sands. Northern Alberta's tar sands are the single biggest supplier of foreign oil to the U.S., ahead of Saudi Arabia and Venezuela, but the extraction process is energy-intensive. Harper acknowledged a push by the U.S. to strengthen labor and environmental provisions under NAFTA, which underpins the world's biggest trade relationship, accounting for as much as $1.5 billion in daily trade between Canada and the U.S. prior to last year's economic meltdown. "We can address these concerns without opening NAFTA and unraveling a complex agreement," said Harper. The tough rhetoric Obama fired at NAFTA during the election campaign has been replaced by caution. Obama thanked Canada for its contributions to the war in Afghanistan, where the country has lost 108 soldiers. But at their first meeting, he did not press Harper to extend Canada's military mission in that country, which expires in 2011. Earlier in the day, Canada's Governor-General, Michaëlle Jean, broke with protocol by buttonholing Obama at the airport for a private meeting that lasted 30 minutes. An immigrant from the impoverished Caribbean nation of Haiti, the former journalist and broadcaster is Canada's symbolic head of state, representing Queen Elizabeth II. Under Canada's constitutional monarchy, the Governor-General normally keeps a low profile, particularly during state visits, but Jean raised eyebrows by breaking with this centuries-old tradition. It was the first of many unscripted moments. Upon arrival on Parliament Hill, feeling the gathering momentum of the Ottawa love-in, Obama took a minute to wave to a cheering crowd of more than 2,000 that had gathered on the wintry front lawn in freezing temperatures. His one-on-one meeting with Harper went from a scheduled 10 minutes to 30  a sign that the two baby boomers have much in common. Harper, 49, has a two young children and is known to listen to Aussie hard rockers AC/DC. Relations between U.S. Presidents and Canadian Prime Ministers have not always been so cordial. Ronald Reagan and Brian Mulroney, both of Irish descent, became fast friends who enjoyed fishing together and singing duets. The closeness of their friendship was a significant factor in the eventual signing of NAFTA. But Lester Pearson, Prime Minister in the '60s, delivered a scathing antiwar speech in Washington at the height of the Vietnam War. The next day at the White House, Lyndon Johnson issued a stern reprimand: "You peed on my rug!" Relations between the two never recovered. And Richard Nixon once famously called Pierre Trudeau a "pompous egghead," to which Trudeau replied, "I've been called worse things by better people." Canadians overlooked Obama's one faux pas  mistakenly calling Ottawa "Iowa"  and seemed to appreciate his stop at a farmers' market to wow crowds and buy a Canadian cinnamon-and-sugar pastry known as a beaver tail. He has set a higher bar for the U.S.-Canada partnership than perhaps any President before. But with the goodwill generated from his first charm offensive, his chances of success look pretty good.